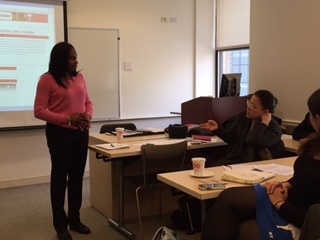 On Friday, February 19, 2016, Dianne Gordon Conyers and Alexandra Rojas from CUNY’s LaGuardia Community College gave a presentation on a grant-funded seminar they facilitated for classroom faculty who wanted to integrate information literacy instruction into a research assignment. The Institute of Museum and Library Services grant was initiated by the Chief and Associate Chief Librarians at LaGuardia. Conyers and Rojas were selected from among the library faculty to co-design and facilitate the multi-part seminar along with a colleague from LaGuardia’s Center for Teaching & Learning (CTL). The report of their initiative brought up many ideas for the dozen or so ACRL/NY members in attendance, and the presenters answered questions about specific strategies employed in this collaborative effort, as well as lessons learned for future faculty development programs. The seminar began as three sessions and subsequently switched to a four-session model. Faculty applied for acceptance into the program, which was designed to align with the concepts of inquiry and problem solving. Participants were required to bring in a research assignment that needed to be revised to include integration of information literacy; they committed to implementing the revised assignment in the same semester in which the seminar was conducted. The grant funding allowed for a stipend for participating classroom faculty, and enough of them applied that the seminar’s organizers were able to select cohorts with disciplinary diversity. The collaborating administrator from the CTL used existing procedures to select participants and to manage the stipends and accounting for the grant. During the first seminar session, Conyers and Rojas provided basic information literacy instruction to participants, raising their awareness of certain library resources and helping them develop a more nuanced perspective of the information universe – for instance, the realization that when faculty tell students “no internet sources,” they are also ruling out use of credible websites. Conyers and Rojas also covered the information publication cycle for different types of sources, as well as the invisible web. During the subsequent session, participants brought in their draft assignments. There was some variety in these assignments—some presented plans for a single class session, some for a research assignment stretching over a number of weeks, and some fell somewhere in-between. In small groups of mixed disciplines, participants each presented her or his activity/assignment, and received peer feedback for integrating information literacy instruction into it. Participants reported that this peer critique session was the most valuable part of the seminar. Participants implemented these assignments prior to the final session of the seminar, which focused on reflection and included a journaling exercise to provide data for assessing the seminar. The initiative’s organizers also implemented an information literacy pre-test and post-test assessment for students, focusing on the concepts of inquiry and problem solving. Challenges the team experienced included keeping things moving during the sessions so that facilitators could complete the day’s agenda, and carving out time for meetings of the three collaborators before and after each session. One of the changes made between the two iterations of the seminar was to add more opportunities for whole group discussion following the small group work. The revised assignment plans created by the seminar’s faculty participants are available online at http://guides.laguardia.edu/oer. This entry was posted in Professional Development and tagged Instruction/Information Literacy DG by Derek Stadler. Bookmark the permalink.